Launching a website attacking the credibility of an animal rights organization is certainly something people might expect the Center for Consumer Freedom, a front group that protects the financial interests of the food, beverage, and tobacco industries to do. 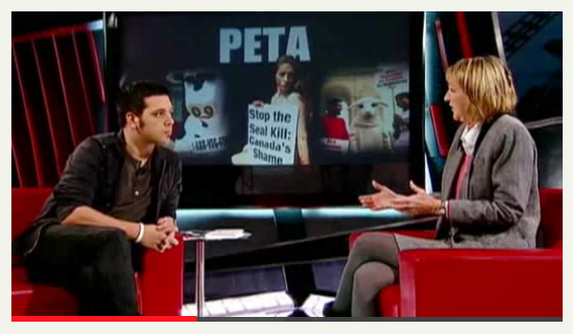 What may be surprising, however, is that the head of the No Kill Advocacy Center recently launched his own website targeting PETA’s credibility--often times using the Center for Consumer Freedom’s template of attacks. Animal protection organizations don’t always agree on what’s best for animals, but generally speaking, when a line is drawn in the sand, entities involved in factory farming, animal research, and other forms of animal exploitation, tend to be on the other side of the line. Applying the proverb “the enemy of my enemy is my friend” to Nathan Winograd’s scenario, introduces an intriguing cast of characters. Back in the mid 1990’s, public relations operative Richard Berman created a template of attacks that would, according to Berman, “unite the restaurant and hospitality industries in a campaign to defend their consumers and marketing programs against attacks from anti-smoking, anti-drinking, anti-meat, etc. activists.” He then pitched the idea in a letter to tobacco giant Phillip Morris. Founded on an initial donation of $600,000 from Phillip Morris, the Center for Consumer Freedom’s client list would eventually boast such industry heavy-hitters as Monsanto, Tyson Foods, Coca-Cola, Wendy’s International, Hormel Foods Corp., Standard Meat Co., and Covance Laboratories--one of the largest animal breeding and testing facilities in the world--of which Phillip Morris is a longstanding client. In 1996, Berman’s front group became the incorporated “charitable” entity known as the “Center for Consumer Freedom,” and began digging into its mission of “protecting the rights of consumers” as they pertained to the financial interests of the tobacco, food, and beverage industries. When the Center for Consumer Freedom stumbled upon PETA’s Virginia Department of Agriculture and Consumer Services animal reporting summary numbers, in the interest of neutralizing one of the tobacco, food, and beverage industries' most outspoken critics, the front group set out to spin the dull straw of PETA’s shelter statistics into a currency that would keep their anti-animal campaign afloat, and as we might expect, they took liberties with the truth towards those interests. 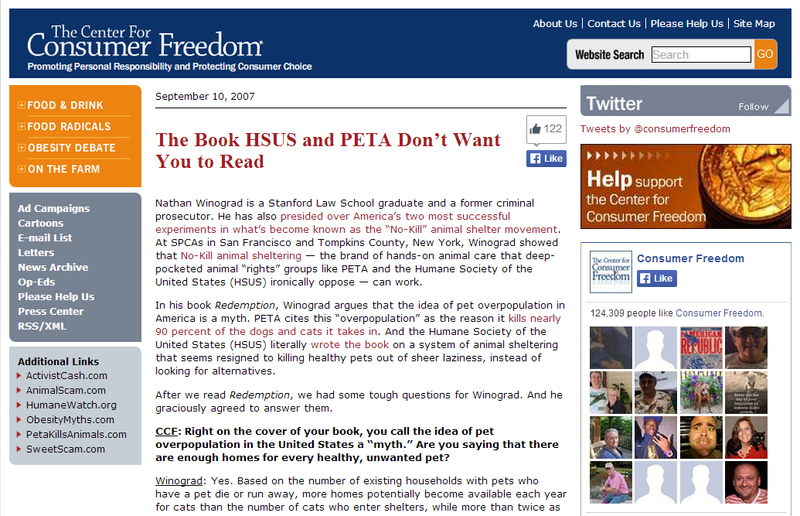 In May of 2005, the Center for Consumer Freedom launched the “petakillsanimals.com” website, a composite of PETA’s 2004 VDACS animal reporting summaries and an array of intentionally stark, red, and uncomfortable graphics claiming that the animal rights group was “killing” most of the animals it received into its shelter. With regards to mitigating PETA’s impact on food and beverage industry bottom lines, the Center for Consumer Freedom was generating a working limb. If PETA--the world’s largest animal rights organization could kill animals, then the CCF’s tobacco, food, and beverage industry donors could certainly confine, deprive, and violently disassemble animals for their lucrative parts, and do it in good conscience. Reeling from the CCF’s disquieting new website, PETA immediately issued a statement explaining that most of the animals entering its Norfolk facility were “broken beings,” and that the organization referred every healthy, cute, young animal it could to traditional animal shelters. But the Center for Consumer Freedom wasn't about to pass up the opportunity to exploit the apparent hypocrisy of the animal rights group ending the lives of animals, not based on the technicality that PETA might be acting in the animals’ best interests. It’s possible that when the interview occurred, Nathan Winograd wasn't aware of the Center for Consumer Freedom’s affiliation with Covance Laboratories, or that at the time of this 2007 interview, that the CCF’s client was proposing to build a new facility in Maricopa County that would produce approximately 170,000 animals every year, many of whom would be dogs and cats and almost all of whom would be killed in experiments. It’s also conceivable that Nathan Winograd might not have known that in 2007, the very year he sat down with the Center for Consumer Freedom to discuss "the problem of PETA," the going rate for a “purpose bred” Covance “Class A” beagle was $575, and that the University of Illinois at Chicago had purchased several hundred beagles from Covance to use in deadly experiments, just one of the universities and research programs Covance sold beagles to in 2007. One could not make the case that he hasn't become familiar with the Center for Consumer Freedom’s “work” since the 2007 interview, however. I cannot tell you exactly how many times I've been on a social media site when some well-meaning person has introduced a link to Nathan Winograd's April 02, 2013 Huffington Post Blog, "Shocking Photos: PETA's Secret Slaughter or Kittens, Puppies," into a discussion about PETA, with the accompanying statement, "do some research," but if I were to hazard a guess, I'd put the estimate well into the hundreds by now. For my part, I have performed extensive records requests through the Freedom of Information Act, I've interviewed PETA, Virginia's State Veterinarian, and shelter directors in PETA's area about PETA's shelter practices, and I've spent considerable time familiarizing myself with Virginia Comprehensive Animal Care Law, so that I may speak about these important matters with accuracy and integrity. That's why I know that there's more to this "research" thing than scouring Google for material that supports any negative views about PETA you already hold, and may want to hold. I recently diagrammed Nathan Winograd's case against PETA and tested the veracity of each of the allegations he makes against them. His claims just didn't withstand the scrutiny. 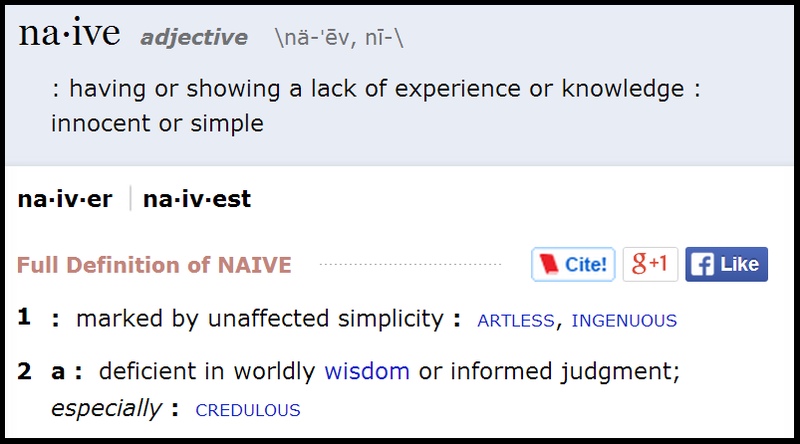 I encourage you to look into the matter more thoroughly too. I think you'll be glad you did. No Seriously. Do Some Research. Encouraging public debate is important. Voicing our opinions in constructive ways can make the world a better place for animals. But whenever someone tries to "inform" us of something that completely defies logic--like the world's largest and most effective animal rights organization indiscriminately euthanizing community animals, we should all endeavor to find out where the "information" is really coming from, and what the messengers have to gain by changing the way we think. Even when the messenger is someone we might otherwise agree with or trust. The next several sections will be dedicated to looking at specific statements and allegations Nathan Winograd makes against PETA, and discussing why the allegations aren't based in truth. "That is when I did what anyone who truly loves animals would have done, I walked away from them. It is what another PETA intern also did when he saw puppies and kittens in the kill room. He quit in disgust." "You don't have to get in bed with the CCF simply because you quote the same information: A truth is a truth, whether it's uttered by St. Francis of Assisi or Vlad the Impaler"
But to refer to either Dave Shishkoff's or Nathan Winograd's statements about their respective claims of having insider knowledge' of PETA's shelter practices as "a truth" is exceedingly generous on anyone's part. Dave Shishkoff allegedly worked for PETA as an intern in 1991, and Nathan Winograd claims he volunteered for PETA in 1992, five years and four years, respectively, before PETA moved its headquarters from Rockville, Maryland, to Norfolk, Virginia, in 1996, where the animal rights group subsequently opened their shelter. 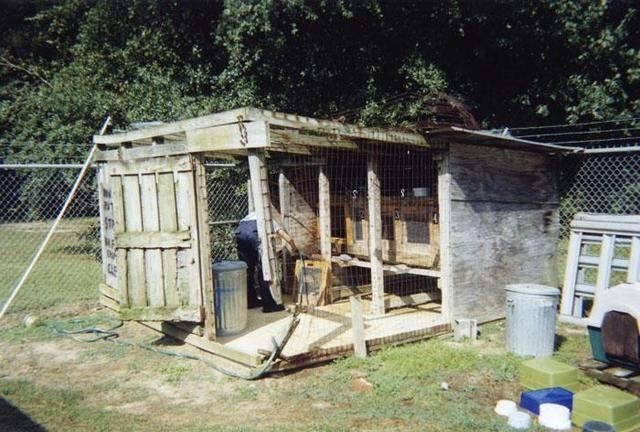 PETA's shelter is an artifact of their move to Norfolk, Virginia in 1996 when the animal rights group began working with animals in the impoverished areas of the Hampton Roads community. 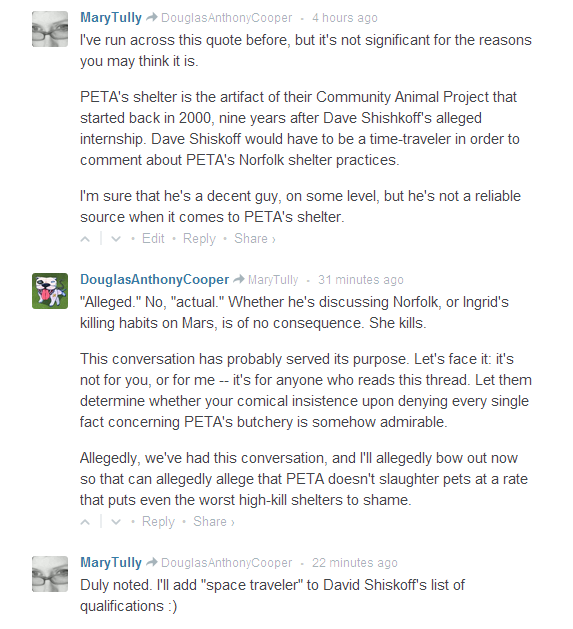 Neither Nathan Winograd, his alleged "roommate," nor Dave Shishkoff could possibly have personal knowledge of PETA's shelter practices, because PETA's shelter wasn't yet in existence when they each claimed to have had experience volunteering for, or working for PETA. 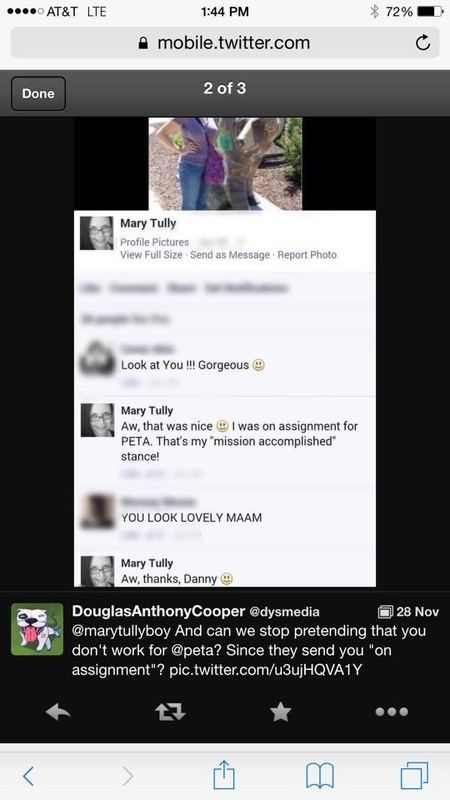 Compare the following versions of the same conversation, the first one as it was "mined" by Douglas Anthony Cooper to make it appear as though I work for PETA, a claim he has made numerous times to discredit my extensive research. The second image shows the conversation in its entirety. UPDATE: Douglas Anthony Cooper has since reached out about the mistake, saying that he was given the abbreviated image, and that he posted it on Twitter having made the false assumption that it was a fair and accurate portrayal of the facts. When I first ran across James McWilliams' March 12, 2012 article, "PETA's Terrible, Horrible, No Good, Very Bad History of Killing Animals," in The Atlantic, having done extensive research into PETA's shelter practices and Virginia Comprehensive Animal Care Law, I saw something of serious concern. "He also observes that the numbers PETA reports historically come from Virginia, which compiles data only for animals taken into custody 'for the purpose of adoption.' 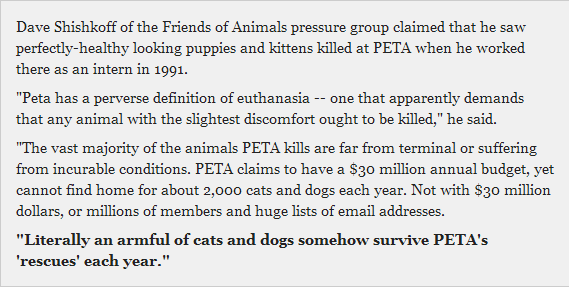 Winograd thus concludes that PETA's claim that it kills so many animals because they are unadoptable is, as he puts it, 'a lie.'" This is one area where I might have to give Nathan Winograd the benefit of the doubt with regards to any nefarious intentions he might have had in making the false statement, because I was actually able to locate a document addressed to PETA from the Commonwealth Of Virginia, stating, "The State Veterinarian's Office of the Virginia Department of Agriculture and Consumer Services requires record keeping and reporting of only those animals that are taken into custody by releasing agencies for the purpose of adoption." 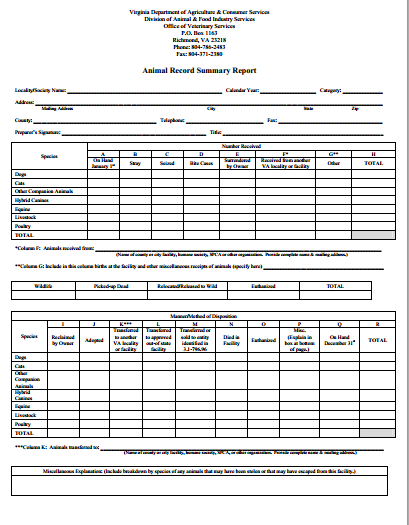 Having spent considerable time examining PETA's and other Virginia animal releasing agencies' Virginia Department of Agriculture and Consumer Services animal reporting summary reports, I knew full well that Virginia requires record keeping and reporting with regards to "wildlife," which is a category of animals considered to be unadoptable by the state, and which is generally taken into custody for the primary purpose of either being re-released into the wild or humanely euthanized, and "strays," which are companion animals taken into custody, first and foremost, for the purpose of reuniting them with their guardians and not necessarily ever for "purpose of adoption." 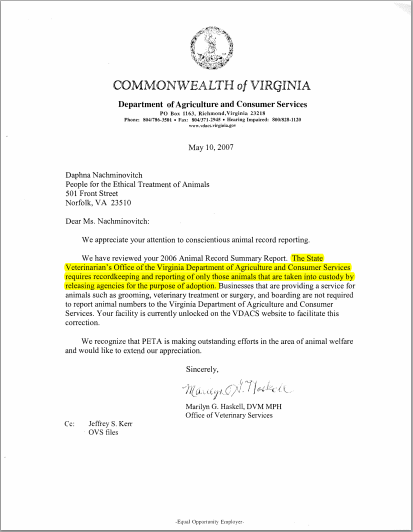 I recently contacted Virginia's State Veterinarian, Dr. Dan Kovich, DVM, MPH, for clarification about the May 10, 2007 letter. In addition to record keeping regarding wildlife and strays, Dr. Kovich confirmed that Virginia also collects data regarding animals who are taken into custody for the purpose of transferring them to other facilities and humanely euthanizing them. We recognize that PETA is making outstanding efforts in the area of animal welfare and would like to extend our appreciation. Often mistakenly referred to as an "investigation report," this document is actually a "site visit" report, and it's typically used by PETA's detractors to create drama and confusion regarding PETA's shelter. 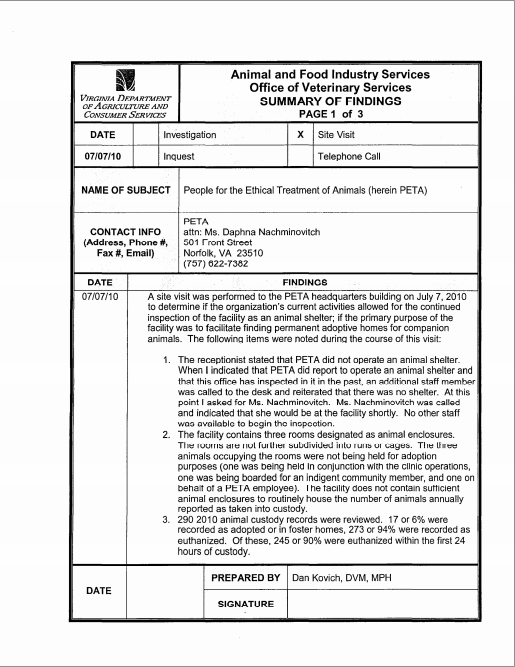 In 2010, precipitated by an email to his office asking for clarification regarding the purpose of PETA's Norfolk animal facility, State Veterinarian, Dr. Dan Kovich, DVM, conducted a site visit at PETA's Norfolk facility to get a better understanding of the type of work the animal rights group was doing there. As part of the reassessment process, Dr. Kovich spoke with Daphna Nachminovitch, the vice president of PETA's Cruelty Investigations Department and the person who oversees PETA's shelter, performed an assessment of PETA's facility, and analyzed the data contained in PETA's 2010 Virginia Department of Agriculture and Consumer Services "animal custody records." He then constructed charts and graphs that quantified the proportions of PETA's adoptions, transfers, and euthanasia procedures, all in an endeavor to determine the facility's "primary purpose." 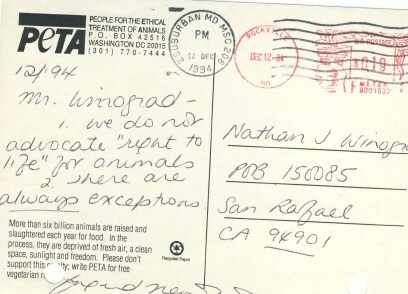 When Dr. Kovich generated his site visit report, he documented that according to Ms. Nachminovitch, the majority of animals that were taken into custody by PETA were considered by them to be unadoptable and that Ms. Nachminovitch had indicated to him that adoptable animals were routinely referred to other area animal shelters for adoption. Consistent with Ms. Nachminovitch's statements, Dr. Kovich documented that according to the findings of his site visit, PETA did not operate a facility that primarily found homes for animals. Operating under the assertion that PETA's facility must operate for the primary purpose of finding permanent adoptive homes for animals, in order to meet the statutory definition of "animal shelter," Dr. Kovich documented that no further action would be taken regarding the findings of his site visit, until such time that Ms. Nachminovitch could respond with material supporting the "legitimacy of PETA for full consideration as an animal shelter." "Private animal shelter" means a facility that is used to house or contain animals and that is owned or operated by an incorporated, nonprofit, and nongovernmental entity, including a humane society, animal welfare organization, society for the prevention of cruelty to animals, or any other organization operating for the purpose of finding permanent adoptive homes for animals. Having seen this Ingrid Newkirk quote, attributed to a December 2, 2008 interview with George Stroumboulopoulos of the Canadian Broadcasting Corporation, referenced many times in many of Nathan Winograd's blogs and discussions, I wanted to see for myself the context with which Newkirk made the statement, and to see if the quote was being used outside its intended context. GS: You have PETA shelters that euthanize lots of animals. GS: I suspect that that's a real problem with your philosophy, because you're killing lots of animals. IN: Oh, it's hideous. I mean, we're the people who don't kill for food, we don't kill for clothing, you name it, we don't. And yet, we are in a very rural, poor area of Virginia and the border of North Carolina, and we offer free euthanasia services for anyone who has a broken, or aged, or injured animal, and no money for veterinary care. GS: But you don't just, it's not just broken or injured animals you guys euthanize, you have lots of animals that go in and get euthanized because of population, right? IN: Actually, for us, we are usually picking up the worst of the worst, the unsocialized, the ones who have been on a chain their whole lives, they're not even able to think about going into a home. Nobody wants them. So yes, in one way, it would be great if every broken animal, it would be lovely if there was someone who said yes, I'll put in the time and effort, but there are wonderful, cute, fluffy small ones that you can't find homes for, but we don't take in adoptable animals usually, unless we have to, we let them go to shelters where people come through and can choose. GS: But you euthanize those pets, those ones, the adoptable ones, if you get them? IN: If we get them and we can't find a home, absolutely. It's the dilemma. It's why I'm so against breeding, and why I say to everybody 'spay and neuter,' and 'don't go to the pet shop, go to the pound.' Save lives, don't take them. 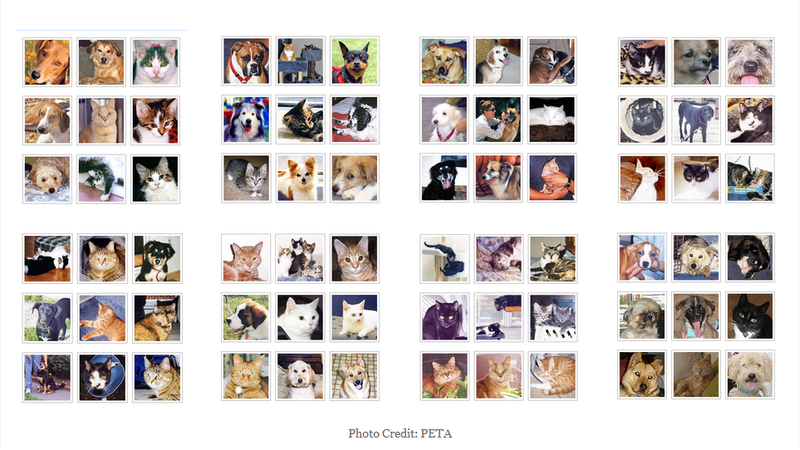 "'Removing the designation will prevent PETA staff from putting to death thousands of animals every year without making any effort to find them adoptive homes,' said Nathan Winograd, director of the No Kill Advocacy Center. 'That's because employees of animal pounds and animal shelters are the only non-veterinarians authorized by the Virginia Code to kill animals.'" 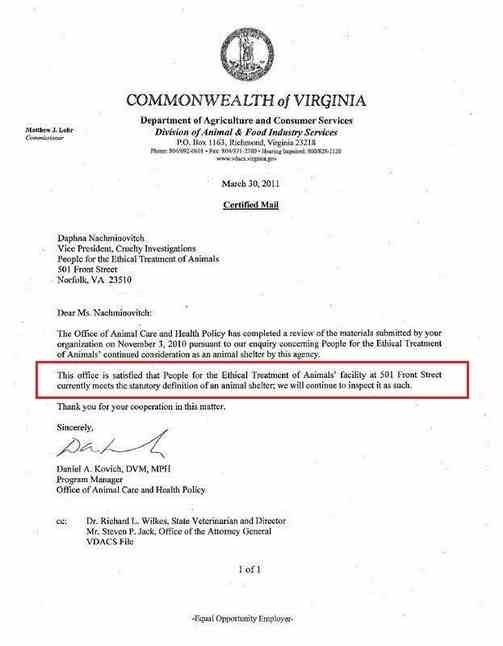 When I first contacted Virginia's State Veterinarian, Dr. Dan Kovich, DVM, MPH, about PETA's shelter, back in February of 2012, I had a lot of questions about PETA's animal releasing agency "licensure," noting that both PETA and their detractors refer to PETA's Norfolk facility as an "animal shelter," while PETA's Virginia Department of Agriculture and Consumer Services animal reporting record summaries list the animal rights organization as a "humane society." Dr. Kovich began by explaining that in Virginia, there is no requirement that non-municipal animal releasing agencies be licensed, so PETA is neither "licensed" as a shelter nor a humane society. I then asked Dr. Kovich, if no licensure is involved, which the state considers PETA to be--a "humane society" or an "animal shelter"--and how the state makes that determination. Dr. Kovich responded, "We consider them to be both," going on to explain that the state considers "animal shelters" to be physical structures, so any releasing agency that has a building that houses animals prior to their disposition, is inspected as an "animal shelter." Meaning, when the state inspects PETA's "shelter," it's inspecting PETA animal housing. When I asked him to explain further the difference between "humane society" and "animal shelter," Dr. Kovich stated that the term "animal shelter" describes a physical structure, and the term "humane society" describes an organization's purpose. 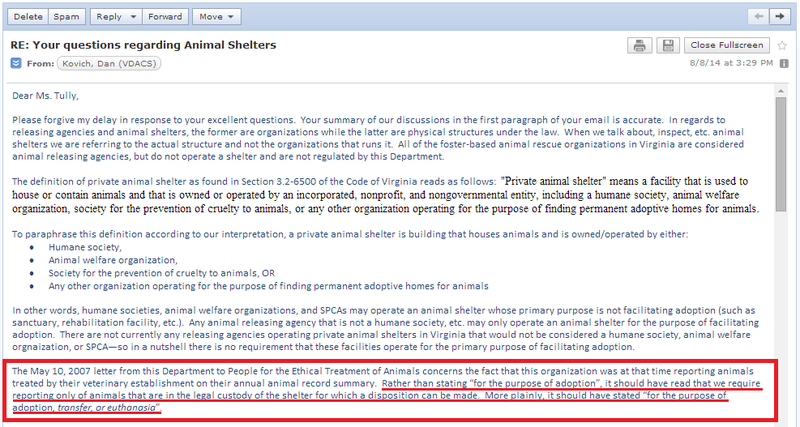 None of the organizations listed on the VDACS animal reporting record summaries are listed as "animal shelters" for that reason--even if the organizations use the words "animal shelter" in their titles. When I asked Dr. Kovich to clarify whether the term "animal shelter" is ever used to describe organizations, he replied, "Not as far as the state is concerned. Organizations can call themselves 'shelters,' but the state doesn't define organizations that way." Dr. Kovich went on to explain that while the public may consider the term "shelter" to be synonymous with "adoption facility," the state does not require animal releasing agencies to operate for the primary purpose of finding companion animals permanent adoptive homes, reminding me that the state considers each of the three methods of disposition--transfer, adoption, and euthanasia--to be equal under the law. In Virginia, an animal releasing agency may operate for the primary purpose providing humane euthanasia to suffering community animals, but as long as they operate a facility that also finds permanent adoptive homes for animals, on any scale, that facility will be considered to be an "animal shelter" and the state will inspect it as such. 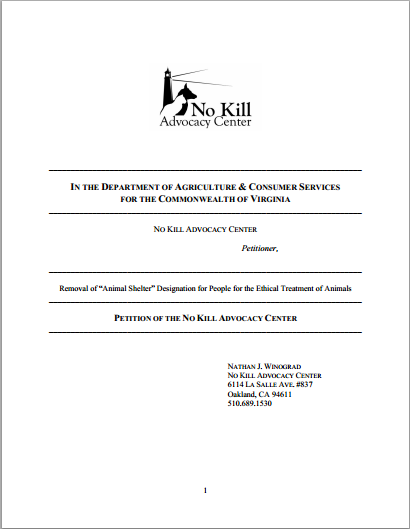 There have been individuals and organizations within the "no kill" community who have shown support the No Kill Advocacy Center's petition, joining Nathan Winograd in his crusade to have the Virginia Department of Agriculture and Consumer Services remove PETA's "shelter status" on the grounds that PETA's shelter doesn't operate for the primary purpose of finding animals permanent adoptive homes. Others have pushed for a change in Virginia Comprehensive Animal Care Law that will mandate that private animal shelters operate for the primary purpose of finding animals permanent adoptive homes, or reflect a definition of "animal shelter" that is more in keeping with what the general public perceives animal shelters to be. PETA's Virginia Department of Agriculture and Consumer Services animal reporting data and shelter inspection reports confirm that nearly every animal PETA receives for euthanasia is received from his or her guardian for this service. There is no indication that these guardians aren't acting in their animals' best interests by requesting this service from PETA's shelter, or that it's in any of their best interests not to be immediately euthanized. 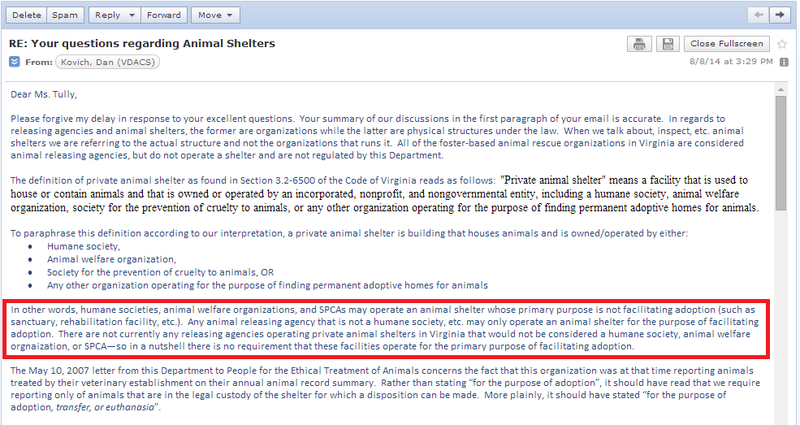 The Commonwealth of Virginia Issues a Statement that PETA's Shelter Meets the Statutory Definition of "Animal Shelter"
"Specifically, VDACS correctly noted that its investigation [sic] to determine if PETA met the statutory definition of a shelter; and it would only meet such a definition 'if the primary purpose of the [PETA] facility was to facilitate finding permanent adoptive homes for companion animals.'" Again, it has been established that there is no statutory requirement that mandates that animal shelters operate for the primary purpose of facilitating adoptions, but the document to which the No Kill Advocacy Center refers, while not an "investigation," did erroneously use the term "primary," in its description of the state's definition of "animal shelter." The VDACS Office of Animal Care and Health Policy subsequently issued a letter stating that it was satisfied that PETA's facility met the statutory definition of animal shelter. *The state performed a "site visit" of PETA's headquarters, not an "investigation"
Virginia Comprehensive Animal Law considers each of the three methods of shelter animal "disposition"--adoption, transfer, and euthanasia, to be equal under the law. Meaning, Virginia animal releasing agencies are not required to record and report any determinations they make about a companion animal's "adoptability." The Virginia Department of Agriculture and Consumer Services does recognize that private animal shelters do receive owned community animals for the purpose of humane euthanasia, however. Dr. Kovich recently stated that with regards to shelters performing humane euthanasia as a community service to owned animals who are experiencing a current crisis of illness or injury, that it "does happens a lot," and that, "the proportions of euthanasia at shelters vary for different reasons and that is an important point to remember." Allegations that PETA euthanizes adoptable animals are not evidence-based, because the State Veterinarian simply doesn't collect that data. During the summer of 2005, two PETA CAP(Community Animal Project) volunteers unwittingly set into motion what can only be described as a modern day witch hunt, when they, against PETA's policy, disposed of the remains of the North Carolina animals they euthanized that day, in a trash receptacle behind a grocery store. It was later determined that the two CAP volunteers had disposed of animals' remains that way on several other occasions unbeknownst to PETA. In 2000, a law enforcement officer witnessed disturbing events at the Bertie County, North Carolina animal shelter, and contacted PETA with shocking photographs he'd taken there--photographs showing a starving dog eating the remains of a dead kitten, a dog lying near death in a flooded enclosure, and rotting puppies lying on the floor outside the shelter’s dilapidated gas chamber, and more. Outraged by the disturbing conditions at the Bertie County animal shelter, PETA galvanized and dispatched a team to North Carolina. PETA staff and volunteers went to work immediately to improve the conditions at the shelter, and PETA sent experts to talk to county officials about ending their use of gas chamber and firearm euthanasia. Under enormous pressure from PETA and its supporters, four North Carolina pounds and shelters entered into agreements with the animal rights organization to improve pound conditions for animals, but county officials refused to budge on the gas chamber issue. PETA began working closely with the shelters that year, pouring over $300,000 into bringing the shelters up to code--even building safe animal housing from the ground up. PETA contracted the services of a local veterinarian who would humanely euthanize animals who would otherwise be suffocated to death in a gas chamber at the Hertford County pound. The animal rights organization tried to persuade the remaining three counties to allow local vets to humanely euthanize their animals as well--on PETA's dime--but for whatever reason the shelters’ officials refused. They would allow PETA to remove and euthanize the animals themselves and at their own expense however, and transport their remains back to Virginia for cremation. Every week, sometimes several times a week, PETA staff and volunteers would make the hours-long trek to North Carolina to clean kennels, feed animals, save as many adoptable animals as they could, and humanely euthanize the ones they would not be able to find homes for. Sick and injured animals on stray holds, who would typically be left to languish in cages, were transported by PETA staff to local veterinarians for treatment. In the words of Daphna Nachminovitch, the head of PETA’s cruelty investigation department, the Community Animal Project volunteers, “broke a matter of trust,” when they acted well outside of PETA’s stated protocol and disposed of the North Carolina pound animals they had euthanized that day, in a private grocery store trash dumpster. PETA was devastated to learn that some of the North Carolina animals had been discarded like trash, but they stood firm in their conviction that sparing animals from barbaric methods of euthanasia had not been an act of cruelty. PETA had instructed the two volunteers to humanely euthanize the animals who could not be offered for adoption for one reason or another, and transport their remains back to Virginia for cremation as per their agreement with North Carolina pound officials. At trial, one of the CAP volunteers testified that the decision to dispose of the animals' remains in the grocery store trash receptacle was made when temperatures that day reached over 100 degrees, accelerating the decomposition of the animals they had euthanized at the North Carolina pounds and shelters. It wasn't a graceful decision, by any means, but it's not hard to see how in the heat of the day, the interior of the van could become uninhabitable for its living occupants. Though these events have nothing to do with PETA's Norfolk shelter practices, the North Carolina incident was a gift to PETA's detractors. By exploiting the public's general lack of accessibility to documents and records pertaining to the incident, Nathan Winograd was able to manufacture a tapestry of events that are purposefully and maliciously misleading. 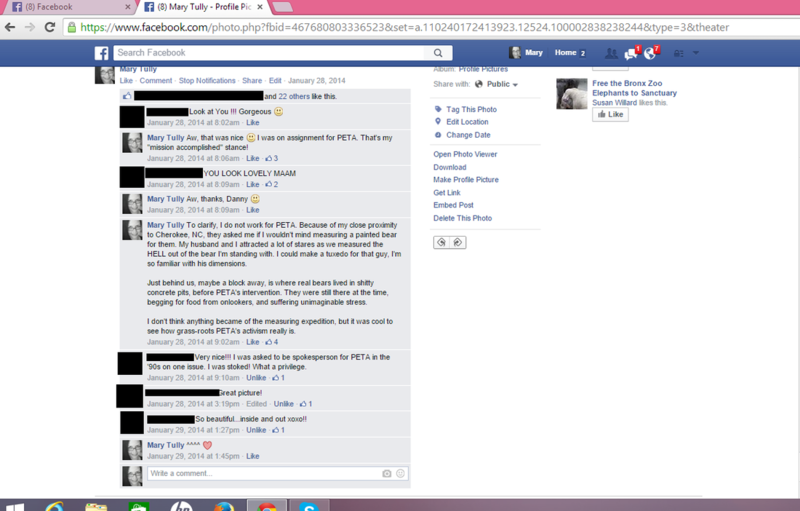 Nathan Winograd fails to inform his readers that A) PETA was never a defendant in the case, B) the actual defendants were cleared of all the charges, C) euthanasia by firearm or gas chamber was a foregone conclusion for every animal PETA removed from North Carolina pounds and shelters, D) PETA did find permanent adoptive homes for many of the North Carolina animals, and E) PETA continued to work with nearly all of these North Carolina pounds and shelters after the trial concluded. This is information that should, in the interest of propriety, be disclosed by anyone who introduces the North Carolina incident into conversations about PETA. Nathan Winograd has gotten a lot of mileage out of the North Carolina incident, describing "a veterinarian's" heartrending testimony and how this veterinarian claimed that he had no idea that the PETA CAP volunteers would euthanize the three animals he told them to remove from his office that day. Nathan Winograd doesn't disclose that this "testimony" came from Dr. Pat Proctor, DVM, the veterinarian whom PETA contracted to humanely euthanize animals who would otherwise be suffocated in the Hertford County pound gas chamber, and that Dr. Proctor performed this duty for several years on PETA's behalf. Over the span of about five years, Dr. Proctor submitted a lot of paperwork to PETA's payroll department to be paid for his veterinary duties at the Hertford County pound. 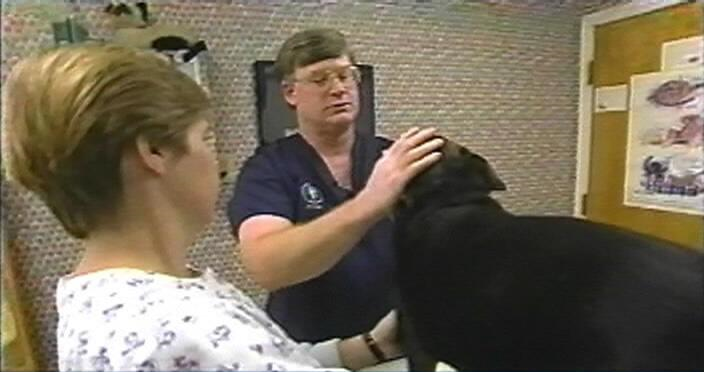 During the course of his professional relationship with PETA, Dr. Proctor was paid in excess of $10,000 for these services. By focusing on the cat and kittens at Dr. Proctor's office, Nathan Winograd leads his readers to believe that magnitude of the problem had been very small, and rather than take the time to find homes for just one cat and two kittens, PETA had euthanized them without even trying. But in reality, the magnitude of the problem was enormous. PETA had been making the trek to North Carolina several times a week, every week, for the better part of five years by this time, taking every animal who was slated for firearm or gas chamber euthanasia out of those four rural pounds to spare them an agonizing death by suffocation. There's not a rescue organization on earth that could undertake a mission of that magnitude and not euthanize at least some animals. There are other things Nathan Winograd omits about the testimony at the trial, like how the defense and the prosecution couldn't agree on which of Dr. Proctor's employees had actually relinquished the animals to the PETA volunteer, and how the prosecution's witness admitted upon cross-examination that while she said she thought that the animals might be found homes, she was never actually promised they would be. She also admitted to knowing that the animals might be euthanized, another telling indication that no "promises" had ever been made. Additionally, this same witness admitted to being aware of the work Dr. Proctor was doing at the Hertford County pound on PETA's behalf. How could anyone at Dr. Proctor's office be "naive" about PETA's work in North Carolina, when he had been making the trek to the Hertford County pound, every week for five years, to euthanize animals on behalf of PETA? Nathan Winograd also fails to mention that when Dr. Proctor was subpoenaed to provide time cards for the employees who were working the day of the incident, he produced an altered time card for one of the prosecution's key witnesses. Without the altered time card, there was otherwise no evidence that the employee had even been present during the incident to "witness" the events. When you get a more complete picture of the actual events, it's not difficult to see why the jury acquitted the defendants of obtaining animals under false pretenses and cruelty to animals. These animals are absent from conversations about the work PETA performed in North Carolina, though they matter just as much. These are some of the many North Carolina animals PETA saved from gas chamber and firearm euthanasia and found permanent adoptive homes for. One of the North Carolina animals became a permanent resident at PETA's Norfolk headquarters. 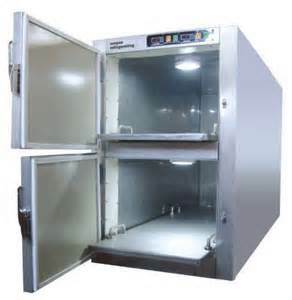 This is a "cadaver" freezer, and because PETA provides humane euthanasia to suffering community animals and sometimes keeps the remains of those animals on-premises for 24 hours or more, per their cremation contract withCremation Services of Tidewater, the state of Virginia requires PETA to have one. Virginia state law (statute 2 VAC 5-110-90) requires all facilities that have animal remains on-premises for 24 hours or more, to have adequate cold storage for those remains--whether the facility is a pet memorial facility, an animal shelter, or a veterinary practice. No one can guarantee animals a "right to life," not even the largest animal rights organization in the world. But what they can advocate for is that animals have the right to a meaningful life, free from exploitation, deprivation, and suffering. PETA refers and transfers adoptable animals to the Virginia Beach SPCA, an open-admission shelter that accepts animals from all jurisdictions and never euthanizes animals for space. During our recent interview, Sharon Q. Adams, the shelter’s director stated that the VBSPCA is able to find homes and foster homes for over 90% of the animals they received. Because the shelter focuses more on serving the community’s animals appropriately than maintaining a low euthanasia rate, the Virginia Beach SPCA does not consider itself to be a “no kill” shelter. "I'm the shelter director at the Norfolk Animal Care Center. We are an open-admission municipal shelter, housing approximately 6,000 animals each year. PETA's headquarters is about 3 miles from my shelter. "I can confirm, without reservation, that PETA assists numerous animals from our community and beyond, in immeasurable ways. They often pick up stray animals, or those from hoarding situations found in the city. They bring them directly to my shelter unless the animal is ill or injured. In those instances, they send me the animal's information (in case an owner is searching for their lost pet) and treat the animal on their dime. Most often, a PETA staff member or volunteer ends up adopting that animal. "In the case of owner relinquished animals, healthy and adoptable animals are transferred from PETA to the Virginia Beach SPCA. The Virginia Beach SPCA has an established adoption rate of around 90% and they are a truly open-admission shelter. "Yes, PETA offers a euthanasia service for area residents who cannot afford traditional veterinary services. They offer these services around the clock, and yet they are vilified by some of the same organizations who refer animals to PETA for euthanasia services. Animals in my community would be far worse off if not for the efforts of PETA. We prefer to focus on the number of euthanasia they have prevented by sterilizing over 100,000 animals in the past few years. If you haven't already, I encourage you to watch this recent video PETA released about their shelter practices and the misconceptions people have about them. In my humble opinion, what PETA has to say about their shelter is just as important as what their detractors have to say about it--if not more so.